An overview of the processes involved in installing Firehalt cavity fire barriers. Smaller videos of the individual steps for convenience are also available. Fully illustrated instructions are provided on the reverse of each pack label. A handy check-list of the tools and fixings you will need to install Firehalt fire barriers. All fixings, staple guns and staples are normally available from your Firehalt stockist or distributor. For contact details, see the Stockists’ page. A demonstration detailing the standard method of top fixing. The method changes slightly, depending on the type of superstructure it’s being fixed to. See the illustrated instructions in our Download section. How to measure the aperture and calculate the barrier length, including allowances for top and bottom fix. The length will change when you encounter penetrations. Additional allowances and adjustments are shown in the next video. fixing the barrier around the services penetrating the barrier only. Fitting penetration seals is covered in a later video. 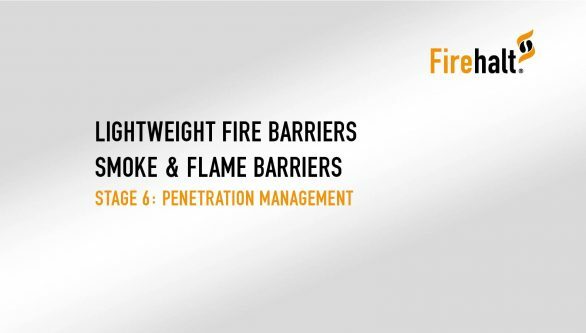 A guide to creating both horizontal and vertical joining seams in Firehalt fire barriers. Detailed fitting instructions, showing staple spacing and configurations, are available in the Download section. They are also on the reverse of the label in each pack. A guide to fixing the barrier at the sides and bottom of the aperture. Detailed fitting instructions, showing fixing spacing and configuration, are available in the Download section. A guide to service penetrations, covering the installation of Brushseal service penetration seals only. Find more on fixing Brushseal penetration management products in the Product Datasheet Download section.